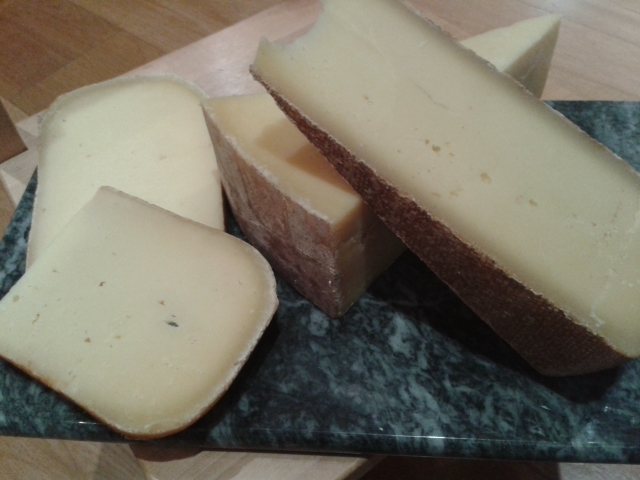 I’d tried Bermondsey Hardpressed at a cheese tasting and it sounded perfect. 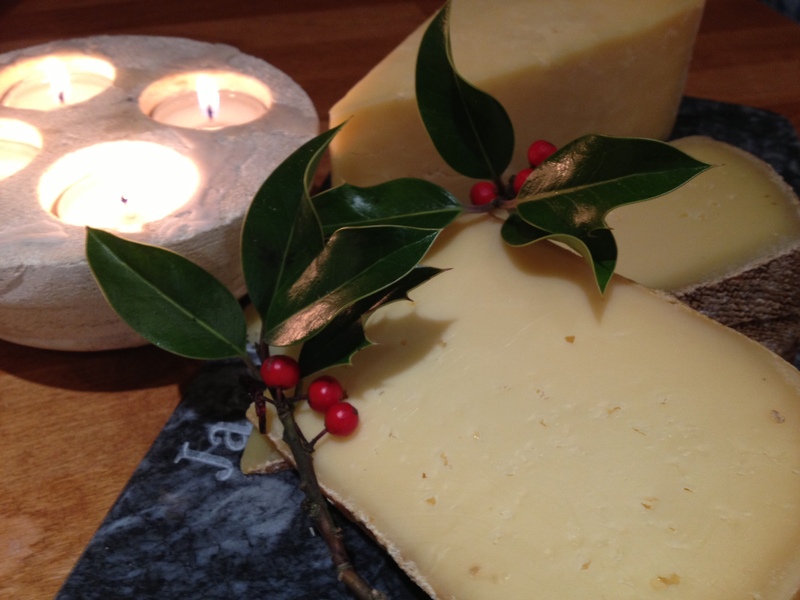 Made by Bill Oglethorpe of Kappacasein under a South London railway arch, it’s an Alpine style cheese. Alas, I couldn’t find Bill’s stall and rumour had it that he wasn’t there on that day of the week. So I was wandering rather forlornly when I came across Alsop and Walker’s stall. Their Sussex Farmhouse cheese declared itself to be ‘ideal for raclettes and fondues’ and on nibbling tasted a bit like a nutty Gruyère so a couple of wedges of that went into my bag and I continued on my way. I haven’t been able to find out much about this cheese, other than it’s apparently ‘a very rare Dutch type cheese, only made by a few cheese makers in Holland and now in the UK’, which is all a bit intriguing. I moseyed on through the market and was ‘sampling’ some expensive chocolate near the cathedral when my nose twitched and I turned around to – hurrah! 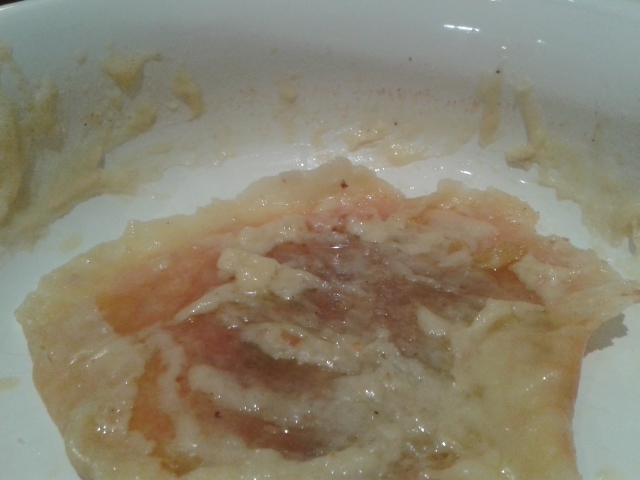 – find the Kappacasein stall (they sell raclettes from the stall which smell of melted cheese heaven). Bill let me try three different Bermondsey Hardpresseds, all of different maturity and I chose the youngest, at just six months. Alpine cheeses are traditionally shaped by both environment and necessity. Cows would be taken high into the mountains to graze during the summer months when pastures were lush, accompanied by one or two herders. Cheeses were made in big durable wheels to make them easier to transport back down the mountains and also because the cheeses needed to feed the family all winter when milk was scarce and so large, dry cheeses would last longer. One chunk of Hardpressed in the bag. One fondue sorted. Both fondues were made in essentially the same way. First, rub the inside of your fondue pot with the cut garlic then add your wine or cider, plus lemon juice if the recipe calls for it. Heat it gently and then start to add your cheese. There will be a lot of cheese. 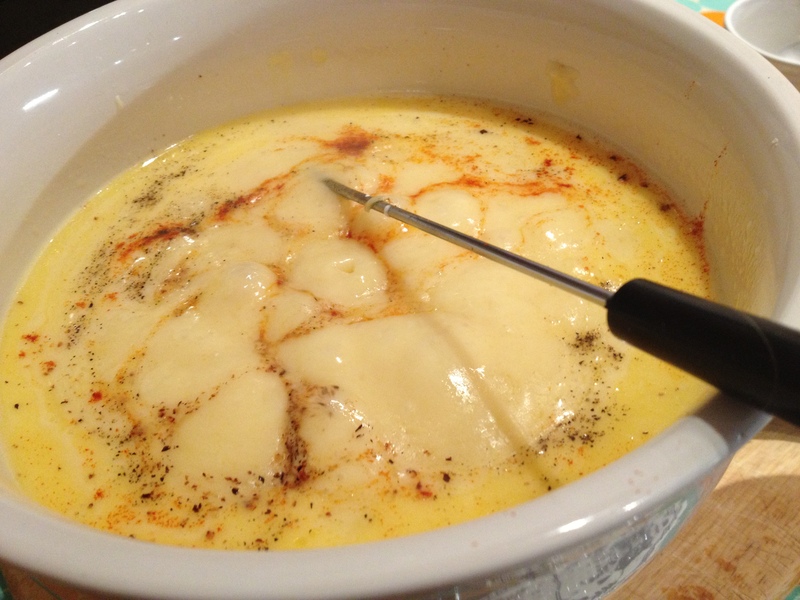 Stir the cheese in, in a figure of eight motion, until the cheese has melted. Blend the cornflour with the Kirsch or with the brandy, mustard powder and Worcestershire Sauce. 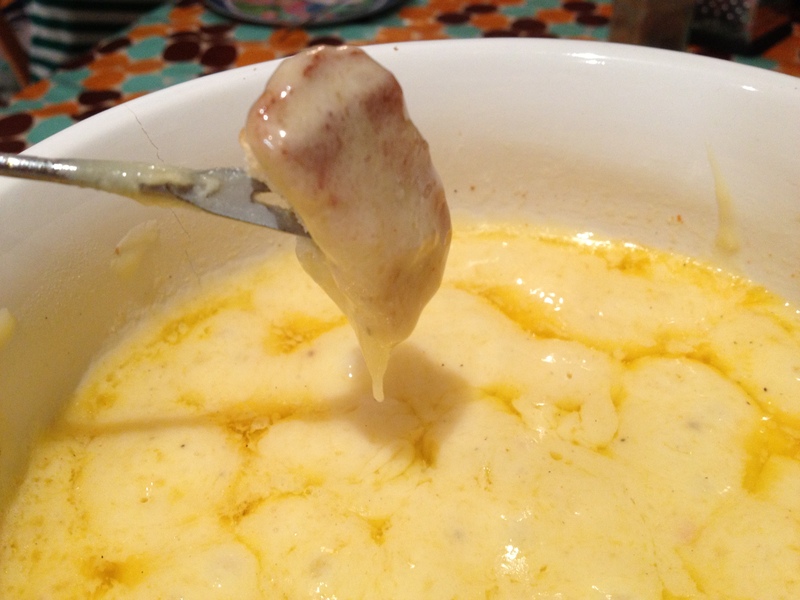 When the cheese is bubbling, add it to the fondue and continue to cook and stir for a couple more minutes. Season to taste. To me, this tastes like a manky old bit of cheese on toast but this is the prized la religieuse, which means ‘the Nun’. There are several theories about why it’s called The Nun; it could be that it supposedly resembles the caps that nuns used to wear or because nuns used to wear several layers of clothing called crusts (I’m not making this up). Anyway, everyone’s meant to fight over it but you’re welcome to it at my gaff. So, did the British cheeses cut the mustard? 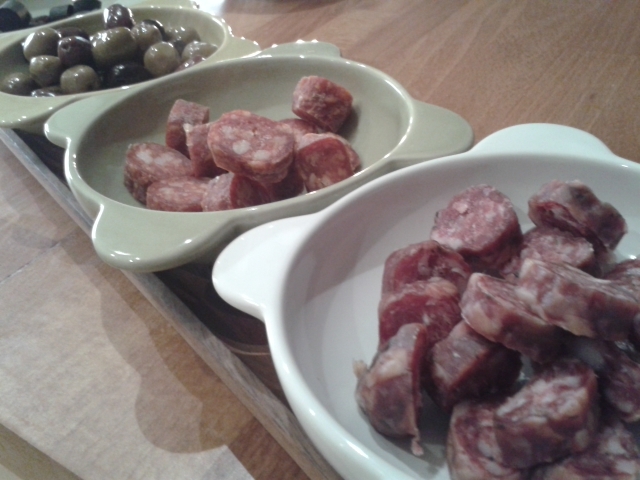 Well, both fondues were delicious and I think as long as you used a good quality cheese, you would get great results. There are lots of other cheeses I’d love to try and fondue, current list-toppers being Lincolnshire Poacher, Teifi, Mayfield and St Gall, as well as a touch of a washed rind like Ardrahan. 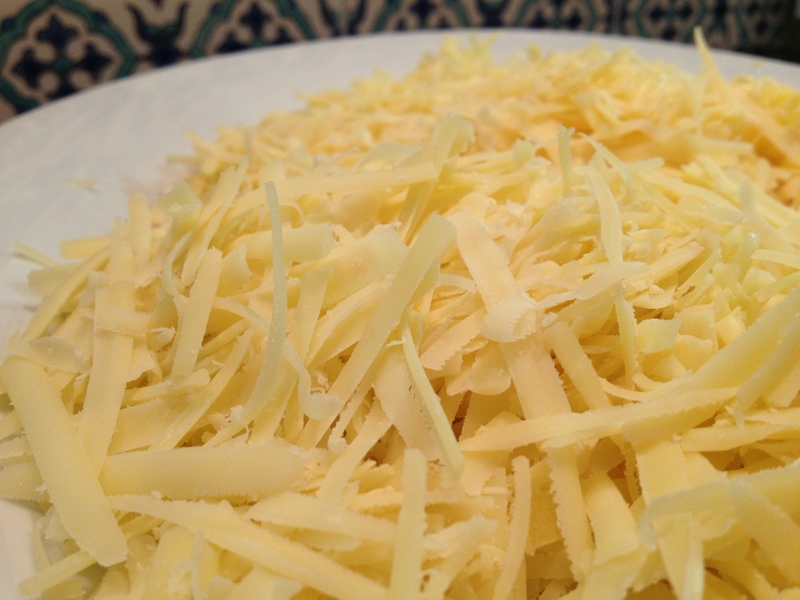 Have you ever fondued with a native cheese? What would you fancy? I certainly think this qualifies as a comfort food and so I’m linking it up with this month’s Cheese, Please! Challenge. Yum Yum! Gherkins and cheese are one of my favourite combinations. Especially if you throw a bit of pastrami into the mix as well! Yes, the gherkins were a big hit – everyone looked at them at first like I’d gone mad but once they started dipping they couldn’t stop. Mmm, pastrami…the salamis above were lovely, especially the black ones just out of focus at the back. I think gherkins are one of those foods that people secretly love but shun when in public because no one likes gherkins, right?! They are a bit weird looking and you could say slightly phallic when whole so how could one possibly like them. But at night they are secretly eating them straight from the jar that they keep hidden at the back of the fridge . . . Sadly our fondue set took itself off to the charity shop after suffering years of neglect… if I’d known about Cheddar and cider fondue, I’d have made more of an effort to convince it to stay! Oh my that looks awesome. Do you know Ive never had a cheese fondue, need to rectify that this weekend, I have a spare can of cider in the fridge that needs used up!! I’d heard about the car keys in the fruit bowl but I only found out about pampas grass recently. Now I can’t drive past any house with a clump of it in the garden without wondering – and there’s an awful lot of it around here. We make our own entertainment in the country (apparently). I don’t know whether to be relieved or insulted that we haven’t been invited to any fondue parties. I could ask one of my neighbours for a pampas grass cutting for you but I’m afraid it might be misconstrued. 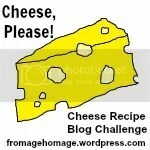 I can dive into that cheese lake! Makes me think I had rackette in the French Alps last year, took the photo’s and never blogged.I hope fondues will be all the rage like it used to, with our without the keys in the fruitbowl…. Made me laugh, arf! Too funny. How awful it must’ve been. 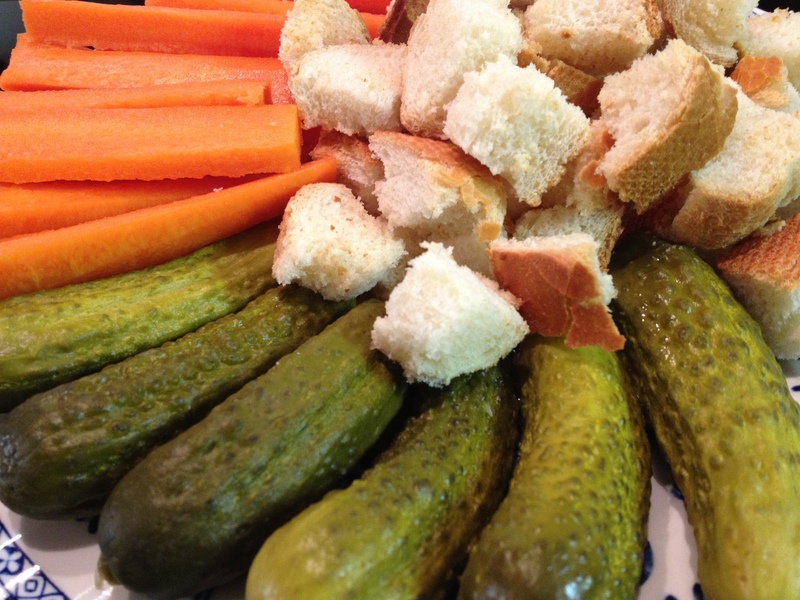 Gherkins I love, especially cornichons. Had never thought of pairing them with melted cheese. Must try. It’ a strange combination but somehow works! I have only discovered the joys of a good fondue since moving over here. We have entire restaurants devoted to the art! Your tale of the shape of the Alpine cheeses puts me in mind of the Annual Cheese Roll that takes place in Gloucester every year. It’s a bit crazy, but great fun. Have you ever been?